Yep, that's right, you read correctly, Shadowgun Legends has been released, and with it comes a whole host of gameplay options. There are over 200+ single-player missions scattered across 4 separate planets, not to mention a wide range of real-time competitive and co-op multiplayer content to work your way through, such as raids and team battles. There are also a plethora of weapons and armor to collect in order to create the ultimate warrior. Plus there is an optional social area where you can converse with other players and group up. It is, of course, a free-to-play title, so just about anyone can install this game as long as their device is compatible. The included in-app purchases range up to $99.99 per item. Mainly these are useful for purchasing in-game currency that can be used for cosmetic items to decorate your soldier, though there is also a starter pack available to net you a large decorative gold ring and some extra inventory and backpack slots. It's about time Madfinger Games got around to releasing Shadowgun Legends, as it was in testing for a what seemed like a really long time. I guess we can rest a little easier knowing the devs tested this one to the fullest extent before it released. So hopefully it's balanced accordingly. If you have been biding your time waiting for this day to arrive, the wait is finally over. Go ahead and hit that download button already and jump on in, the water is fine. SHADOWGUN LEGENDS IS NOW AVAILABLE WORLDWIDE. THE LEGEND BEGINS! A life of fame awaits players in Shadowgun Legends, a feature-packed FPS/RPG. The world's first persistent mobile shooter offers true AAA experience, bringing players epic campaign, co-op raids, competitive PvP, deep RPG elements and fun-packed hub. March 22nd, 2018 - Brno, Czech Republic – MADFINGER Games is a studio founded by veteran developers with the common goal of creating console quality video games on the emerging mobile platform. That desire is hardwired into the studio’s DNA and now the time has come for the next evolutionary leap. The entire studio has spent the past three years devoting their skill and experience to a project that will kick mobile gaming to the next level. 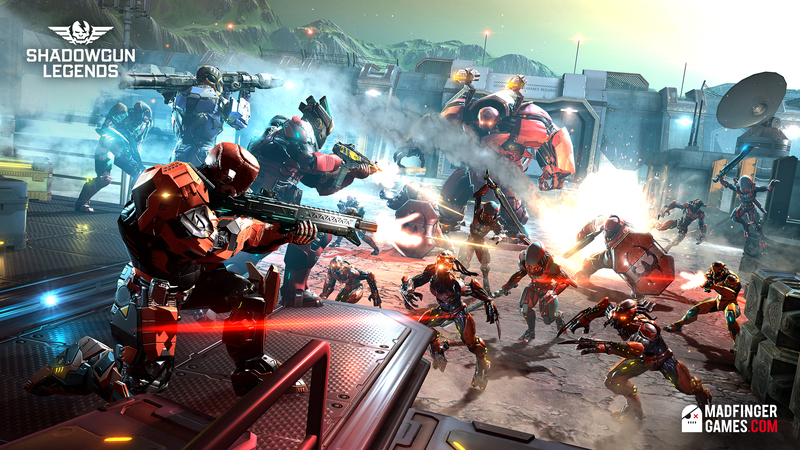 “We promised ourselves one thing - we would stretch our resources to the limit in order to maximize on all the skills we have at our disposal.” Said CEO, co-founder and Game Director Marek Rabas, “We strongly believe that with Shadowgun Legends we have created a totally unique game experience, because mobile platform capabilities are unlimited.” Added Rabas. Combining Single Player Campaign, Cooperative and Competitive Multiplayer in the game with unprecedented gameplay and visual quality was certainly a challenge. Adding innovative social features, unique fame system and RPG elements on top of that seemed almost crazy. Zero tolerance for nothing but excellence caused number of delays, but in the end, the battle was won. It was a tremendous amount of effort for a small team, but the combination of hard work, MAD DNA and veterans of mobile and console worlds alike made the dream a reality. After a great amount of polishing, technical improvements and optimizations, the studio finally overcame all obstacles and succeeded. MADFINGER Games are ready to unleash Shadowgun Legends onto the world and throw one hell of a party. Shadowgun Legends is launching globally on Android, iOS, Apple TV and NVIDIA SHIELD TV.